With new iPhones on the market, it’s prime shopping season for used iPhones as upgraders look to sell their older models. But as much as used iPhones can be a good deal (an iPhone 5 is still magic! ), buying used can be stressful, due to working with a stranger, dealing with payment logistics, and worrying if the iPhone has any unseen problems. However, thanks to a new tool from Apple, you can at least make sure the iPhone isn’t stolen. The point of these features is to discourage theft, since once Activation Lock has been enabled, a stolen iPhone is worthless to a thief. 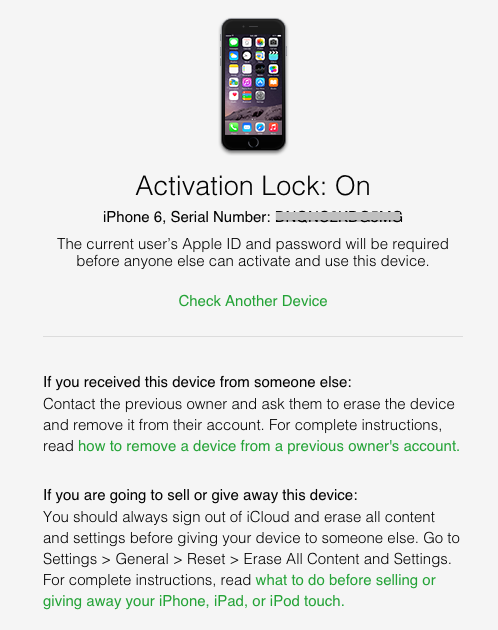 Or at least it is as long as potential buyers know to check if Activation Lock has been turned on. There are two ways to disable Activation Lock, which you would need to do before sending it in for service or selling it to someone who will need to reactivate it on another account. You can turn off Find My iPhone in Settings > iCloud, or you can erase the device entirely with Settings > General > Reset > Erase All Content and Settings. In either case, you will be prompted to enter your iCloud password first — that’s the key fact that a thief is unlikely to know. So, where does all this leave you, the prospective used iPhone buyer? As I mentioned above, Apple has introduced a Check Activation Lock Status tool (note that it doesn’t work on mobile browsers). To use it, you need the IMEI or serial number from the device, which can be found in Settings > General > About. The IMEI or serial number can also be found on the rear panel of the device, if you have really good eyes or a magnifying glass. 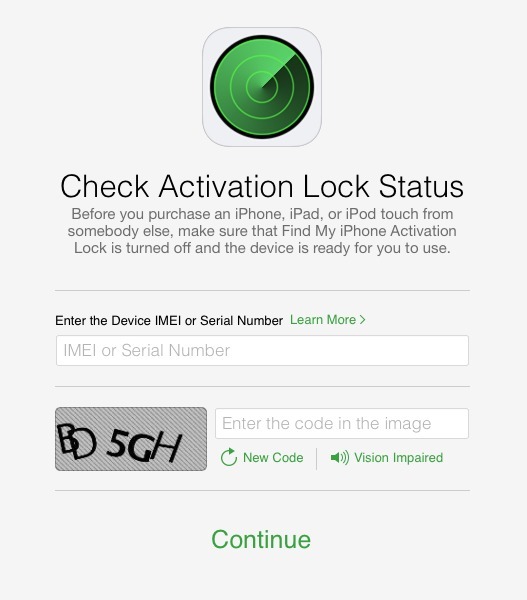 To check the status of Activation Lock on a device, enter the IMEI or serial number, then enter the CAPTCHA. I had problems trying to read the CAPTCHA, so it might take a few tries. Alternatively, click Vision Impaired to hear an audio CAPTCHA. The Web page then informs you whether Activation Lock is on or off. If it’s on, Apple provides links to additional resources. To make the most out of Apple’s Check Activation Lock Status tool, I recommend asking the seller to provide the serial number or IMEI before agreeing to the purchase. That way, you can make sure that you’re not wasting your time, or potentially getting into an undesirable situation. The web tool that Apple provided won't really stop anybody from getting scammed in a fraudulent sale over the Internet. The thief selling the locked iPhone could either provide a different serial number of an unlocked iPhone, or they could provide the real serial number BEFORE the phone gets locked. There is ONLY ONE WAY to protect yourself: test the phone in person by trying to erase it. Verizon suggested we meet a seller from Craigslist at their nearby store. Interest in the iPhone would have ended if the seller had balked. Besides the personal safety issue, they checked the phone and swapped the service. This is a good point. When I sold my Droid, I did it at a Verizon store, and the employee was very helpful.